In the Mekong region (Vietnam, Cambodia and Laos), a large investigation was conducted to assess the susceptibility of Anopheles species against DDT and pyrethroids. In this study, the resistance status of the potential malaria vectors An. vagus, An. sinensis, An. paraliae and An. peditaeniatus was assessed. Bioassays were performed on field collected unfed female mosquitoes using the standard WHO susceptibility tests. In addition, the DIIS6 region of the para-type sodium channel gene was amplified and sequenced and four allele-specific PCR assays were developed to assess the kdr frequencies. In Southern Vietnam all species were DDT and pyrethroid resistant, which might suggest the presence of a kdr resistance mechanism. Sequence-analysis of the DIIS6 region of the para-type sodium channel gene revealed the presence of a L1014S kdr mutation in An. vagus, An. sinensis and An. paraliae. In An. peditaeniatus, a low frequency L1014S kdr mutation was found in combination with a high frequency L1014F kdr mutation. For pyrethroids and DDT, no genotypic differentiation was found between survivors and non-survivors for any of these species. In the two widespread species, An. vagus and An. sinensis, kdr was found only in southern Vietnam and in Cambodia near the Vietnamese border. Different levels of resistance were measured in Laos, Cambodia and Vietnam. The kdr mutation in different Anopheles species seems to occur in the same geographical area. These species breed in open agricultural lands where malaria endemicity is low or absent and vector control programs less intensive. It is therefore likely that the selection pressure occurred on the larval stages by insecticides used for agricultural purposes. Insecticide resistance may jeopardize the enormous malaria control efforts which have resulted in a significant decrease in the malaria burden in the Mekong region . Insects may survive the toxic effect of insecticides by different resistance mechanisms. The major mechanisms involve either mutations within the target site of the insecticide or an alteration in the rate of insecticide detoxification. The para-type sodium channel is the target for both pyrethroids and DDT and mutations in this gene have been linked to knockdown resistance (kdr) in several insects . In the malaria vector Anopheles gambiae sensu lato, two different mutations at codon 1014 of domain II of the sodium channel gene have been associated with knockdown resistance. The first mutation involves a point mutation resulting in a leucine-to-phenylalanine (L1014F) substitution, whereas a second mutation results in a leucine-to-serine (L1014S) substitution [3, 4]. Recently, a leucine-to-cysteine (L1014C) substitution was found in permethrin resistant An. sinensis populations of Korea . In the detoxification of insecticides, different enzyme families are involved and elevated levels of esterases, monooxygenases and glutathione-S-transferases (GST) have been linked with insecticide resistance in Anopheles [6–9]. In the Mekong countries, a large investigation has been conducted to assess the susceptibility of different Anopheles species against pyrethroid insecticides and DDT. Amongst the main malaria vectors, Anopheles epiroticus was highly pyrethroid resistant in the Mekong delta, whereas An. minimus s.l. was pyrethroid resistant in some localities in northern Vietnam . A low level of phenotypic pyrethroid resistance was found in An. dirus sensu stricto from central Vietnam . In these main malaria vectors no kdr mutation was observed . Here, the resistance status of the potential vectors An. vagus, An. sinensis, An. paraliae and An. peditaeniatus was assessed. These species are abundant in the Mekong region and despite their zoophilic trend they regularly bite humans  and can play a role in the maintenance of malaria at low or epidemic level . An. sinensis contributes to low malaria endemicity in the plains of China  and epidemics in North Korea . Based on positive CSP ELISA tests on head and thorax, An vagus has been suspected as malaria vector in Bangladesh [16, 17], Sri Lanka  and in the Assam state of India . Similarly An. peditaeniatus was found ELISA positive in Thailand  and Sri Lanka . An. paraliae and An. sinensis are genetically closely related and can be easily confused on morphological characters. An. sinensis and An peditaeniatus are also vectors of Brugia malayi [20, 21]. All these species breed in open agricultural lands, like rice fields [22–24] and can be considered as indicator species for insecticide pressure from agricultural origins. In this study, the role of kdr mutations in the different resistant An. vagus, An. sinensis, An. paraliae and An. peditaeniatus populations of the Mekong region was assessed. Bioassays were done in the framework of a cross country survey on insecticide resistance in the Mekong region . The list of the study sites with coordinates is giving in Additional file 1. Briefly, from 2003 until 2005 adult female mosquitoes were collected by different collection methods throughout Vietnam, Cambodia and Laos and identified morphologically in the field by use of a standardized key for medically important anophelines . Bioassays were performed using the standard WHO susceptibility test kit with diagnostic concentrations of 0.75% permethrin and 4% DDT . The bioassays were done on adult collected unfed female mosquitoes meaning that the age of the tested specimens was unknown. Additional bioassays were performed with diagnostic concentrations of type II pyrethroids (0.05% lambda-cyhalothrin, 0.082% (30 mg/m2) alpha-cypermethrin or 0.05% deltamethrin) and 0.5% etofenprox. Impregnated and control papers were supplied by the Vector Control Research Unit, Universiti Sains Malaysia. The exposure time was 60 min with tubes maintained in the vertical position. After exposure, mosquitoes were kept under observation for 24 h and supplied with 10% sugar solution. Mortality was read after this 24 h period and corrected by Abbott's formula, if the control mortality was between 5 and 20% . The bioassay results were divided into three mortality categories according to the WHO criteria . A 24 h post-exposure mortality less than 80% indicates resistance, whereas a mortality higher than 98% indicates susceptibility. Intermediate mortality levels suggest the possibility of resistance that needs to be confirmed. After the bioassays, the mosquitoes were dried over silica gel. One to six legs of individual mosquitoes were used for genomic DNA extraction, applying the procedure described in Collins et al. . DNA was resuspended in 25 μl TE buffer (10 mM Tris-HCl pH 8; 1 mM EDTA). A negative control was included with every set of extractions. The identification of An. vagus, An. sinensis, An. paraliae and An. peditaeniatus specimens of which the DIIS6 region of the para-type sodium channel gene was sequenced, was confirmed by sequencing of the ITS2 rDNA gene using the primers described in Van Bortel et al. .
Primers Agd1 and Agd2  were used to amplify the DIIS6 region (kdr- region or transmembrane segment 6 of the domain II) of the para-type sodium channel gene for An. vagus, whereas primers Agd1Mi and Agd2H (Figure 1) amplified the DIIS6 region for An. sinensis, An. paraliae and An. peditaeniatus. Amplification was performed in a 50 μl reaction containing 1 μl of template DNA, 1 × Qiagen PCR buffer, 1 mM MgCl2, 200 μM of each dNTP, 100 nM of each primer and 1 unit Taq DNA polymerase (Taq PCR core kit, Qiagen, Hilden, Germany). Schematic representation and the primer sequences of the AS-PCRs used to detect the L1014S kdr mutation in An. vagus (AS-PCR I), An. sinensis (AS-PCR II), An. paraliae (AS-PCR II), An. peditaeniatus (AS-PCRIII) and the L1014F kdr mutation in An. peditaeniatus (AS-PCR IV). The figure represents the DIIS6 region of the sodium channel gene. 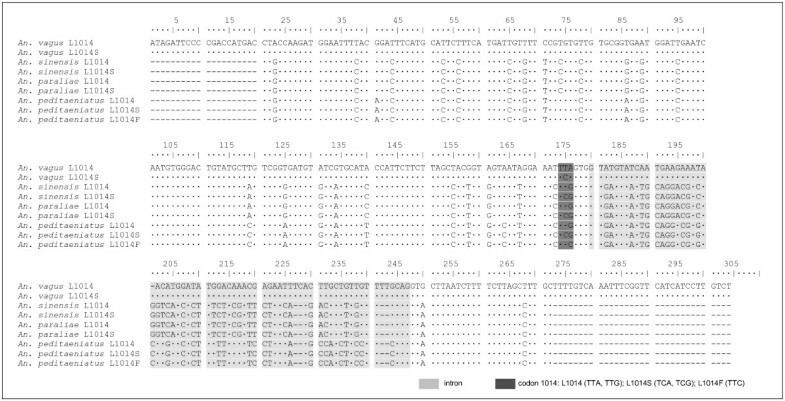 The intron is represented by a box and codon 1014 is indicated by a star graphic. The cycling conditions were as follows: initial denaturation at 94°C for 3 min, 40 cycles of 1 min denaturation at 94°C, 30 s annealing at 47°C and 30 s extension at 72°C followed by a final extension of 10 min at 72°C. Amplification products were checked on a 2% agarose gel, stained with ethidium bromide and visualised on the Syngene Ingenius LHR (Westburg, Leusden, The Netherlands). The resulting PCR product was cloned by use of the Original TA cloning kit according to the manufacturer's instructions (Invitrogen, Carlsbad, California). Plasmid and direct PCR sequencing were done by the VIB genetic service facility (University of Antwerp, Belgium) and aligned with ClustalW version 1.3 . The DIIS6 sequences were used to develop primers for four allele-specific PCR assays (AS-PCRs) to assess the kdr frequencies in the different Anopheles populations. An additional A was added to 3'-end of the primer Vaguss in order to minimize self-complementarity and additional mismatch bases were introduced in the Sinensiss and Sinensisr primers at the 4th nucleotide from the 3'-end (A was replaced by T) to obtain more specific results (Figure 1). The AS-PCR assays were optimized by running genomic DNA templates that had been previously genotyped by DNA sequencing. All AS-PCR assays were performed in a 50 μl reaction mixture containing: 1 × Qiagen PCR buffer, 1 × Q solution, 0.5 mM MgCl2, 200 μM dNTP's, 400 nM of the outer forward and reverse primer, 500 nM of the inner resistant and sensitive primer (Figure 1), 1 unit Taq DNA polymerase (Qiagen, Hilden, Germany) and 1 μl template. The cycling conditions described above for the amplification of the DIIS6 region were used. The amplification products were electrophoresed on a 3% mixed agarose gel (1.5% agarose and 1.5% small fragment agarose) and visualised under UV light after ethidium bromide staining. In each assay, a sequenced heterozygote resistant mosquito was run with the AS-PCR as positive control. The kdr genotype frequencies of mosquitoes exposed to WHO bioassay were compared for dead and surviving using the exact tests for population differentiation in Genepop (version 3.4) . Details of the bioassays can be found in Additional file 2. DDT resistance was widespread over the An. vagus populations of Laos, Cambodia and Vietnam. In Laos and northern Vietnam, the An. vagus populations remained pyrethroid susceptible. In Cambodia, the An. vagus populations were pyrethroid susceptible or tolerant. In southern Vietnam, the pyrethroid resistance increased and a combination of DDT and pyrethroid resistance was found (Figure 2). Mortality categories obtained for the An. vagus populations of Vietnam, Laos and Cambodia. The first quartile (right, up) represents the results obtained with 0.75% permethrin (PERM). In clockwise direction, results with discriminating concentrations of lambda-cyhalothrin (LAMBDA), alpha-cypermethrin (ALPHA) (Vietnam) or deltamethrin (DELTA) (Cambodia and Laos) and DDT are given. The number of exposed mosquitoes varied from 20 (KPSB, lambda-cyhalothrin)* to 296 (LSYB, DDT). * LKMA (perm, delta, alpha); LKMB (perm, delta), KPSB (perm), KPLA (lambda), KTRB (lambda): number of exposed mosquitoes <20. The Vietnamese An. sinensis populations were possibly DDT resistant. In southern Vietnam, a combination of DDT and pyrethroid resistance was found for An. sinensis, An. paraliae and An. peditaeniatus (Figure 3). Mortality categories obtained for An. sinensis, An. paraliae and An. peditaeniatus. The first quartile (up right) represents the results obtained with 0.75% permethrin (PERM). In clockwise direction, results with discriminating concentrations of lambda-cyhalothrin (LAMBDA), alpha-cypermethrin (ALPHA) and DDT are given. The number of exposed An. sinensis varied from 20* (VTYA, permethrin) to 113 (VLCA, alpha-cypermethrin; VTHB, lambda-cyhalothrin) whereas the number of exposed An. peditaeniatus varied from 100 to 105. For each insecticide between 20 (VTYA, permethrin) and 73 (VTYA, DDT) An. paraliae mosquitoes were exposed. * VHGB (perm): number of exposed mosquitoes <20. Sequences of the DIIS6 region of the para-type sodium channel gene were obtained for both, live and dead An. vagus (n = 65), An. sinensis (n = 33), An. paraliae (n = 21) and An. peditaeniatus (n = 87) mosquitoes. In pyrethroid and DDT resistant An. vagus, An. sinensis and An. paraliae populations, a leucine-to-serine replacement at codon 1014 was observed. In An. peditaeniatus, both a leucine-to-phenylalanine and a leucine-to-serine replacement were detected at codon 1014. The last amino acid replacement was only detected in combination with the L1014F mutation. To confirm the presence of both kdr alleles in An. peditaeniatus individuals, cloning and plasmid sequencing was performed (Figure 4). Alignment of genomic DNA fragments of the DIIS6 region of the para -type sodium channel gene obtained for An. vagus , An. sinensis , An. paraliae and An. peditaeniatus. The position of the intron was determined by comparison with the mRNA sequences available in GenBank for An. vagus and An. gambiae [DQ026447; Y13592]. The sequences were aligned with ClustalW version 1.83 . Identical nucleotides are indicated by a point (·), dashes (-) refer to missing nucleotides. At amino acid level the wild type An. vagus (L1014), An. sinensis (L1014), An. paraliae (L1014) and An. peditaeniatus (L1014) are 100% identical to the amino acid composition of the DIIS6 region of a wild type An. gambiae [Y13592]. In order to determine the kdr frequencies in the Southeast Asian Anopheles populations, four different PCR assays were developed to detect the L1014S in An. vagus (AS-PCR I), An. sinensis and An. paraliae (AS-PCR II), An. peditaeniatus (AS-PCR III) and the L1014F kdr mutation in An. peditaeniatus (AS-PCR IV). 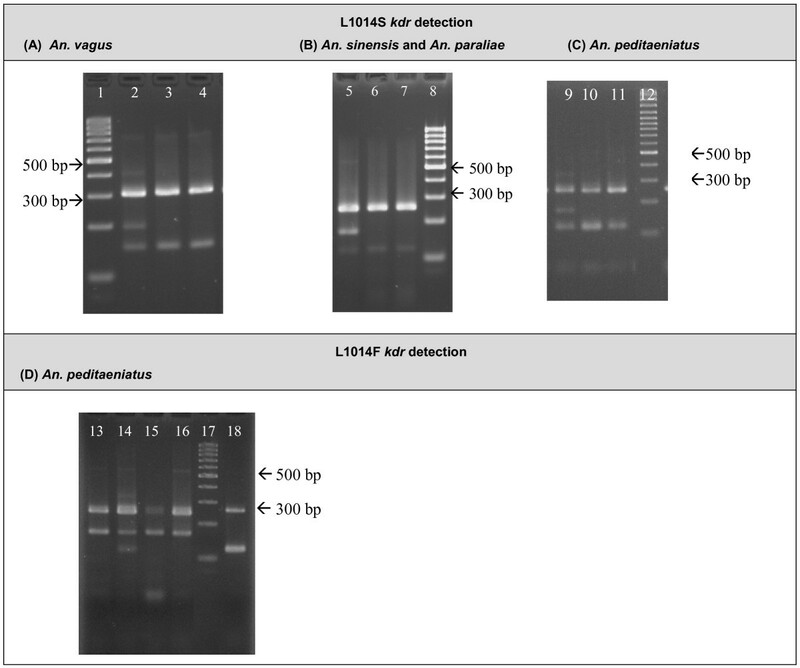 For the detection of the L1014S mutation, an internal control band (303 bp for An. vagus; 255 bp for An. sinensis, An. paraliae and An. peditaeniatus), a specific band for the L1014S kdr allele (194 bp in An. vagus, 171 bp in An. sinensis, An. paraliae and An. peditaeniatus) and a band for the wild type L1014 allele were obtained (147 bp for An. vagus, 119 bp for An. sinensis, An. paraliae and An. peditaeniatus) (Figure 5). The AS-PCR IV assay was designed to detect the L1014F kdr mutation in An. peditaeniatus with a control band of 255 bp, a 171 bp band for the L1014F allele and a 119 bp band for the wild type L1014 allele. The Fpedis primer (sensitive specific) of the AS-PRC IV assay can also anneal to the L1014S allele, hence the L1014S kdr allele can be misrecognized as the wild type allele L1014. This non-specific annealing can occur because there is only one nucleotide mismatch between the second nucleotide from the 3'-end of primer Fpedis and the sequence of the L1014S allele (T-C mismatch). For this reason the results of both PCRs (AS-PCR III and IV) needed to be combined in order to genotype the An. peditaeniatus specimens correctly. PCR fragments obtained using the different AS-PCRs after separation on a 3% mixed agarose gel. (A). Detection of the L1014S mutation in An. vagus (AS-PCR I). Lane 1:100 bp ladder; Lane 2: heterozygous specimens (L1014/L1014S); Lane 3 and 4: homozygous wild type mosquitoes (L1014/L1014). (B) Detection of the L1014S mutation in An. sinensis and An. paraliae (AS-PCR II). Lane 5: heterozygous specimens (L1014/L1014S); Lane 6 and 7: homozygous wild type mosquitoes (L1014/L1014); Lane 8: 100 bp ladder. (C) Detection of the L1014S mutation in An. peditaeniatus (AS-PCR III). Lane 9: heterozygous specimens (L1014/L1014S); Lane 10 and 11: homozygous wild type mosquitoes (L1014/L1014); Lane 8: 100 bp ladder. (D) Detection of the L1014F mutation in An. peditaeniatus (AS-PCR IV). Lane 13, 15 and 16: homozygous resistant specimen (L1014F/L1014F); Lane 14: heterozygous mosquito (L1014/L1014F); Lane 17: 100 bp ladder; Lane 18: homozygous wild type mosquito (L1014/L1014). By use of these AS-PCRs, 3305 An. 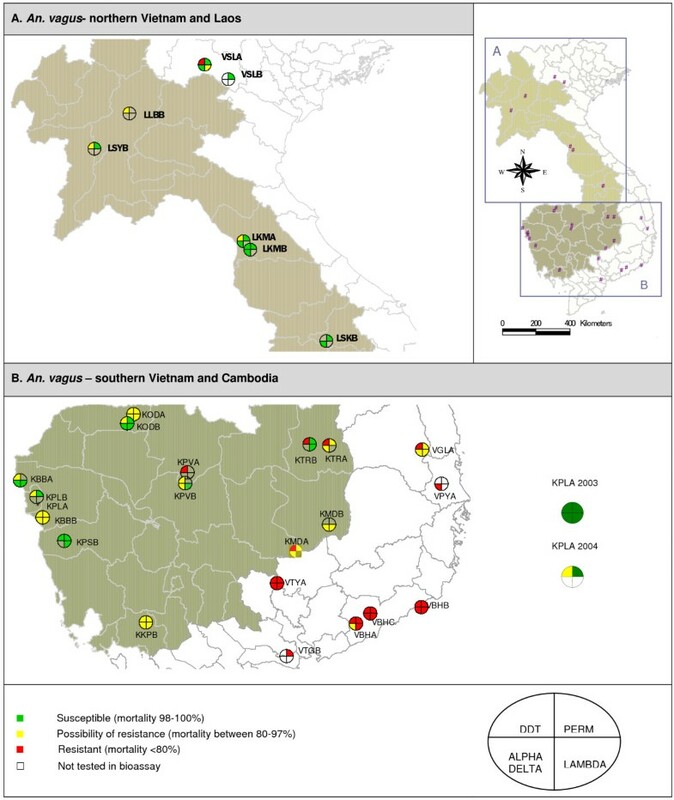 vagus mosquitoes of 28 populations throughout Vietnam, Laos and Cambodia were analysed for the presence of the L1014S kdr mutation. The L1014S allele was found only in 7 populations in heterozygote form (L1014S/L1014 genotype) in southern Vietnam and in Cambodia near the Vietnamese border with a frequency varying from 0.7% to 15.7% (Table 1). The highest kdr frequency was reported in the VTGB population, which is the most southerly located An. vagus population. However, in VTGB the L1014S kdr frequency is likely to be overestimated, because only specimens that survived the permethrin WHO bioassay were analysed, whereas in the other An. vagus populations, both bioassay survivors and non-survivors were tested. All bioassay survivors and non-survivors were analysed. Only populations where kdr mutations were found are included in the table. Deviation from Hardy-Weinberg expectation (HWE - exact test using GENEPOP ). * Frequency based only on bioassay survivors. nd = not detected. By use of the AS-PCR II, 1058 An. sinensis specimens of 8 populations were genotyped for the L1014S mutation. The L1014S kdr mutation was found only in one population of southern Vietnam at a low frequency (2.3%) (Table 1). In the two widespread Anopheles species, An. vagus and An. 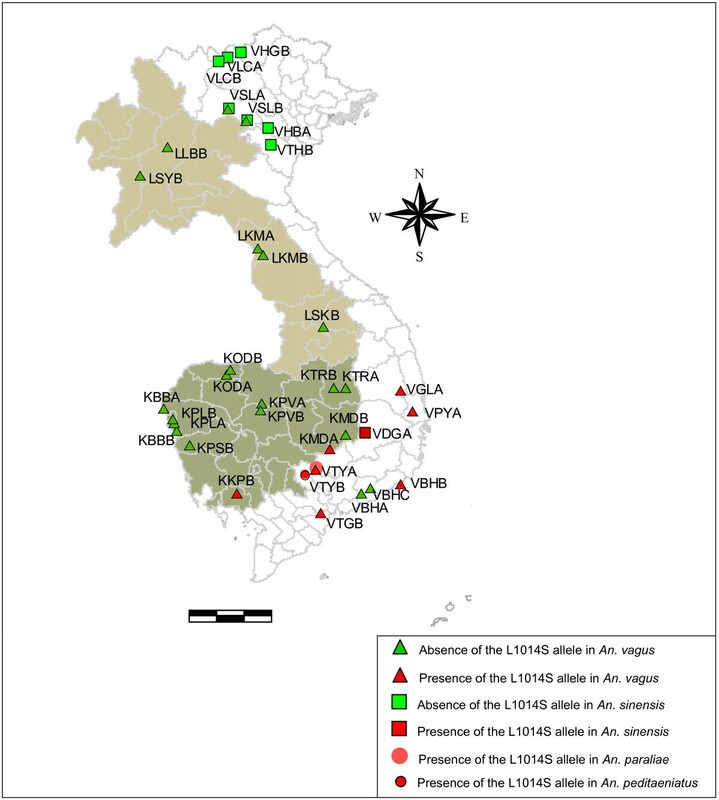 sinensis, the geographical distribution of the L1014S kdr mutation overlap in southern Vietnam (Figure 6). In An. paraliae, the L1014S kdr mutation was found at a moderate level (32.8%) in southern Vietnam (VTYA) (Table 1). In An. peditaeniatus of southern Vietnam (VTYB), the L1014F kdr allele was observed at a high frequency (97.6%, n = 446). The L1014S kdr allele was only observed in combination with the L1014F kdr allele at a low frequency (0.3%) The three specimens with the L1014S/L1014F genotype survived the discriminative dosage of DDT or lambda-cyhalothrin in the bioassay (Table 2). Geographical distribution of the L1014S kdr allele in An. vagus, An. sinensis , An. paraliae and An. peditaeniatus. For each population, at least 20 specimens were analyzed. For An. vagus, the genotypes of the different populations could be pooled, because for each population the kdr genotypes were equally distributed among the bioassay survivors and non-survivors (exact test for population differentiation using GENEPOP ). 1 Pooled results for An. vagus populations of KMDA, KKPB, VBHC, VGLA, VPYA and VTYA. The An. vagus population of VTGB was excluded from the analysis, because only permethrin survivors were available. 2 A: Alive, D: Dead; 24 hours after exposure to a discriminative dosage of an insecticide in a WHO bioassay. 3 p-value of the genotypic differentiation between survivors and non-survivors (* correlation is significant at the 0.05 level) (Genepop; ). To assess the role of the kdr mutations in conferring resistance, a comparison was made between the different kdr genotypes and the survival status in the bioassay. For the four species, the different kdr genotypes were equally distributed among bioassay survivors and non-survivors, even when homozygote resistant specimens were present (Table 2). From 2003 to 2005, WHO bioassays were performed on the An. vagus, An. sinensis, An. paraliae and An. peditaeniatus populations of Vietnam, Laos and Cambodia to assess their susceptibility to DDT and pyrethroids. Different levels of pyrethroid and DDT resistance were found. In the present bioassays, field collected females of unknown age were used, whereas the WHO protocol recommends the use of 1-3 day old females. As mortality in bioassays is significantly higher with old females compared with young ones  the results of the current study only underestimate the resistance problem. In southern Vietnam, An. vagus, An. sinensis, An. peditaeniatus and An. paraliae were highly resistant to both DDT and pyrethroids, which might suggest the presence of kdr. Sequences of the DIIS6 region of the para-type sodium channel gene, revealed the presence of a L1014S kdr mutation in An. vagus, An. sinensis, An. paraliae and An. peditaeniatus and a L1014F kdr mutation in An. peditaeniatus. In the two widespread species, An. vagus and An. sinensi s, knockdown resistance was observed only in Cambodia near the Vietnamese border and in southern Vietnam. In these species, the L1014S kdr allele was found at a low frequency and only in the heterozygous form. In An. paraliae, the L1014S kdr frequency was higher and both heterozygous and homozygous resistant mosquitoes were observed. In An. peditaeniatus, the L1014S kdr allele was very rare (0.3%) and was found only in combination with the common L1014F kdr allele (97.6%). Interestingly, in An. gambiae s.s. of Uganda, Equatorial Guinea, Gabon and Cameroon, specimens were found to carry the same kdr mutations in a heterozygous state (L1014F/L1014S genotype) [32–35]. For An. vagus, An. sinensis, An. paraliae and An. peditaeniatus, the different kdr genotypes were equally distributed among bioassay survivors and non-survivors. For An. vagus and An. sinensis this could be expected since kdr is a recessive trait [36, 37] and the L1014S kdr mutation was only found in the heterozygous form. In An. paraliae, however, homozygous resistant L1014S/L1014S mosquitoes were found and equally distributed among bioassay survivors and non-survivors. Also in the An. peditaeniatus population where the L1014F kdr allele occurs at high allelic frequency, no connection was found between the genotype and resistant phenotype. In An. peditaeniatus, even homozygous resistant L1014F/L1014F mosquitoes were found among the dead mosquitoes which suggest that beside the L1014F kdr mutation other subsequent mutations in the para-type sodium channel gene might be needed for a mosquito to survive an exposure to a discriminating concentration of an insecticide. Such secondary mutations were found in Haematobia irritans and Musca domestica populations where super-kdr mutations (M918T) in the DIIS4-DIIS5 linker of the para-type sodium channel enhanced the pyrethroid resistance of individuals with the L1014F kdr mutation [38, 39]. Because in the present work only the DIIS6 region of the para-type sodium channel gene was sequenced, the presence of additional mutations in the para-type sodium channel gene can not be excluded. However, to date, no additional mutations were described in Anopheles species. In the widespread An. vagus and An. sinensis, kdr was geographically limited to an area in Southern Vietnam. In northern Vietnam, other resistance mechanisms could be involved. A limited number of populations were screened by biochemical assays (results not shown). Preliminary biochemical assays on DDT resistant An. vagus and An. sinensis populations revealed a high GST activity in Northern and Southern Vietnam. High esterase activity was found in pyrethroid resistant An. vagus (VBHA and VBHB) and An. sinensis (VHBA 2003, VLCA, VSLA, VSLB) populations without kdr, whereas elevated levels of esterase activity were not detected in a kdr resistant population (An. vagus: VTYA) (data not shown). This shows that beside knockdown resistance, other mechanisms of insecticide resistance should be systematically explored. Resistance to insecticides in malaria vectors has been often related to the use of insecticides in agronomy  and seems most likely to have developed as a consequence of selection pressure on larvae . The fact that in the same geographical area (southern Vietnam and Cambodia near the Vietnamese border) the kdr resistance mechanism was selected in different Anopheles species (An. vagus, An. sinensis, An. paraliae and An. peditaeniatus) with a similar breeding ecology points in the same direction. An. vagus, An. sinensis, An. paraliae and An. peditaeniatu s breed in rice fields [22, 23, 42] which can be exposed to agricultural insecticides. In this study, investigators failed to collect correct information on pesticide use at household or communal level. However, in Vietnam, the pesticide use in rice fields accounted for 65.5% of the total market value of pesticides in 1996. The pesticide use was the highest in Southern Vietnam where there is a great tendency towards the application of cheaper, hazardous pesticides, including DDT [43, 44]. The use of these insecticides in agriculture can explain why DDT resistance still exists in these vectors. The complex insecticide resistance pattern varying with species and region demonstrates that insecticide resistance in Anopheles species of the Mekong region is a complex and dynamic process. Knowledge on the factors which determine insecticide resistance will be necessary to guide an efficient use of insecticides in both public health and agriculture. MC and WVB designed the study; revised and supervised the work at all stages. KV carried out the molecular work and drafted the manuscript. HDT, TS and KK supervised the bioassays in the field. All authors read and approved the final manuscript.